ObviousIdea! is a new Internet business created in 2011 by one of the founders of VSO-Software SARL, to develop and promote personal computer software, web services and mobile applications. Toulouse. 21 March 2011. - After months of discussion, ObviousIdea! is finally announcing the sale of its shares in VSO-Software SARL, another software publisher based in Toulouse, which provides popular software with a global customer base particularly in the fields of file conversion and DVD recording applications. Why this news is important for ObviousIdea! ? The completed deal is equivalent to a US$700,000 first round fund raising in cash for the new venture, but it also includes a catalog of popular software products from VSO-Software and their corresponding database of registered users. This database of users and products will help to introduce new projects as upgrades become available. Fabrice Meuwissen, the CEO and founder of ObviousIdea!, previously shareholder and CEO of VSO-Software states: “the agreement reached makes me very confident for the future of our new venture, as the most difficult task is to build a brand and a community of users”. Serial entrepreneur Fabrice Meuwissen is planning to invest in start-ups and new companies. “As I won’t be able to spend all the money available in my new venture, I want to give some of it back to the community to help others, like I would have appreciated to be helped myself”, says Mr Meuwissen, “Toulouse has France’s largest University and a lively hi-tech scene. It’s something I am already doing here as a business angel, but with the web traffic of our new ventures I will be able to help both with money and online exposure”. ObviousIdea!’s aim is to be a consumer centric company, users will participate actively in the life of software products, suggesting new features, deciding where and how to implement the action and services. “I am sick of companies whose support staff don’t bother to react to suggestions customers make by email, if you are lucky enough to receive a reply at all” says Mr Meuwissen: “It is something so easy to set up with social networks and specialized tools such as Uservoice, or SnapEngage. You need to engage the user in every process of your company if you want to be successful, however many millions you may have in your bank account”. But… ObviousIdea! is already facing a challenge, which is to build a larger team of developers ( php, jquery, html5, .net, Delphi, css guru ), community managers, and enthusiasts. The new company owner states that the biggest issue for now will be to recruit to be sure the new projects will be released on time. ObviousIdea! was founded in 2011 as a breakaway from VSO Software SARL. It holds a portfolio of popular software applications in the areas of GPS, photography, photo sharing, compression and web communities. ObviousIdea! was founded by Fabrice Meuwissen, who is a usability expert and consultant in Strategic Marketing graduated from Stanford University in 2010. Fabrice was previously Product manager in a Text-To-Speech company and partnership manager in a international e-commerce solution for Mac OS. For questions or if you would like to test any software products as a journalist please contact us on tel. +44 (0)20 76177469 or email pr (at) iitm.info . ObviousIdea! also offer promotions and software for reader offers. FotoInsight launches its hi-gloss photobooks today. The new glossy finish is a product innovation producing more intense colours and crisp pictures. High gloss photobooks are treated with a protective varnish. Cambridge. 14 March 2011. - FotoInsight broadens its range of photo books with shine. Unlike some glossy photobooks simply produced on glossy paper, FotoInsight’s new hi-gloss is achieved by applying a protective coating to the photo book pages. In an additional step at the end of the print process a PU varnish will be heat-treated, achieving an even, durable hi-gloss finish, producing brilliant, shiny colours. The individual design and order process follows the same familiar steps as already known from FotoInsight’s Designer software. The high gloss finish is available in the glossy photobook formats Panorama and XL. 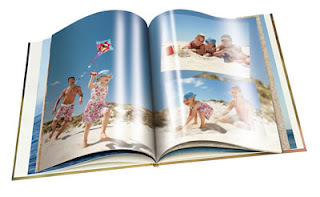 The extra cost for the hi-gloss finish on the 26 page A4 Panorama photo book is £6.20. Hi-gloss photo books are available in the formats Large Panorama (about A4) and XL (about 12” x 12”) with 26 to 154 pages (in increments of 8 pages). Every FotoInsight photobook is printed on paper produced under the guidelines for sustainable forestry. Bespoke photobooks are as durable as coffee table photo books from book shops. All materials used are subject to extensive testing and are guaranteed by their manufacturers to last 100 years. The glossy finish not only looks better, it also protects the photobook pages’ surface.